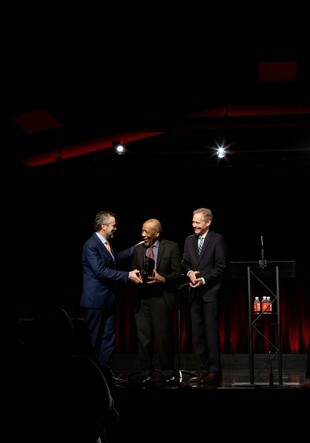 John M. Perkins is Biola University’s 2019 Charles W. Colson Conviction and Courage award recipient. 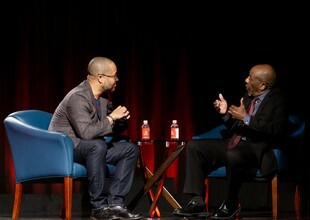 Biola President Barry H. Corey presented Perkins with the award at Biola’s Student Congress on Racial Reconciliation (SCORR) on Feb. 22, where Perkins gave the keynote address. Perkins is an internationally known author, American Christian minister, civil rights activist, Bible teacher, author, philosopher and community developer. At the award ceremony, Corey called Perkins a source of hope for the biblical call toward unity in Christ. “Perkins has achieved remarkable heights in his many years of his life in leadership,” said Corey. Recipients of the Colson Award have chosen a life of serving God no matter what challenges they face or difficulties they have to overcome. Perkins was born into poverty as the son of a Mississippi sharecropper and fled to California at the age of 17 after his older brother was murdered by a town marshal. In 1960, he accepted Christ and returned to Mississippi to share the gospel. He faced repeated harassment, imprisonment and beatings as a result of his outspoken support and leadership role in civil rights demonstrations. Today, he is one of the leading evangelical voices to come out of the American civil rights movement. “This is not the end, but hopefully a continuation of what was started in my life through this movement, a revival from the church,” said Perkins upon receiving the award. Perkins stated his work has been a joint venture and that he couldn’t be more honored than by the partnership and friendship of so many throughout his life. “God intended the church to be a group of friends,” he said. Perkins gave the keynote address at SCORR after the ceremony with Bryan Loritts, lead pastor of Abundant Life Christian Fellowship in Silicon Valley, Calif. and Biola board of trustee. Biola established the Charles W. Colson Conviction and Courage Award in 2014, with the Colson family, to honor the legacy of the Christian leader Chuck Colson. Colson’s convictions align with Biola’s mission to equip men and women in mind and character to impact the world for Christ by living lives of conviction and courage. The award honors Colson’s legacy and celebrates Christian leaders who live in the same fashion. Past recipients include Maggie Gobran — “Mama Maggie” — the founder of Stephen’s Children in 2018; author and disability advocate Joni Eareckson Tada in 2017; religious freedom advocate Paul Marshall in 2016; humanitarian Baroness Caroline Cox in 2015; and Colson himself in 2014, awarded posthumously. Perkins has been recognized for his work with 14 honorary doctorate degrees from schools including Belhaven University, Lynchburg College, Wheaton College, Gordon College, Taylor University and Northern Seminary. He has served on the board of directors for both World Vision and Prison Fellowship. Learn more about Biola University’s Student Congress on Racial Reconciliation. For more information, contact Jenna Loumagne, manager of media relations, at jenna.loumagne@biola.edu.